“It could have been a ski mask. It could have been a bandanna. It could have been a hoodie. It just happens to be a Gumby costume,” San Diego police Detective Gary Hassen said. Some criminals wear a mask, but some decide to cosplay. What's cosplay? Cosplay , short for "costume play," is where people dress up as their favorite characters for conventions or fun. Just to clarify, I'm not talking about guys like The Dark Knight Rises theater shooter. That man is a sick individual. Some are funny, some are silly and some are scary, but here they are. Stan Worby from Bradford, England turned another man, Daniel Frayne, in to police for cashing stolen checks. 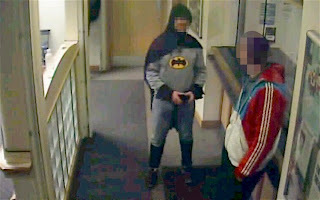 Since he looked like Batman, he was hailed as a real life "Caped Crusader." He humbly said, "I'm no superhero. I eat kebabs. So for this to happen the first time I dress up, I just can't believe it." It turns out, the two were friends and Frayne asked for a ride to the police station. Worby was just a 39-year old delivery guy returning from a soccer (football) game. The police later stopped Frayne and the "Bradford Batman" for trespassing in a garage and stealing £770 ($1,182) worth of power tools. What was once an inspirational story of one man making a difference, turned into a story about two bums committing petty theft. The next guy actually dressed like a villain. 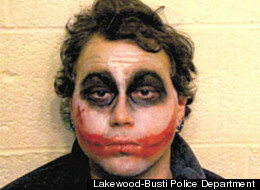 In upstate new York, a guy walks into an Applebee's restaurant looking like Joker from The Dark Knight. It's not October or anything, so people are probably getting a kick out of it. How fun is that? 24-year-old Aaron Chase was drunk as a skunk, had no money and started harassing people. So, they call the cops to kick the "Clown Prince of Crime" out for trying to order an "Appletini." I guess the joke was on him. One night in Florida, a bunch of cosplaying doctors visit a few bars. It's just a friendly group of costumed fans having drinks and blowing off steam. What could possibly go wrong? Raymond Adamcik, a 54-year-old doctor dressed as Captain America, sticks a burrito in his pants. He asks women if they want to touch it. Not surprisingly, this pick-up line gets him many rejections. So, he takes the burrito out and starts "groping" a girl. Someone calls the cops. According to the police report, "There were so many cartoon characters in the bar at the time, all Captain America’s [sic] were asked to go outside for a possible identification." A woman picks out the guy in the crowd of "First Avengers" and he gets taken to jail. But, he gets caught trying to flush a marijuana joint down the toilet. 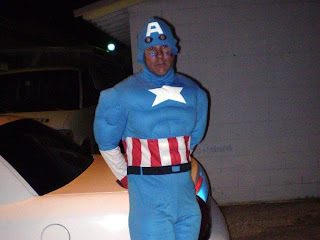 So much for this idiot's "Super Soldier Serum." One man has patrolled the streets of Seattle fighting for justice wearing a skintight black-and-gold rubber suit and mask. That man is Benjamin John Francis Fodor, who goes by the name "Phoenix Jones." One night, a group of friends are leaving a bar dancing and having a good time. Ssuddenly a dude in black leather "came up from behind and pepper sprayed the group." The way Jones describes it, he was breaking up a fight. He started screaming "call 911!" and bravely took off to stop them. He broke out his "Phoenix-Jones-Pepper-Spray" (I assume he calls it that) and let loose a cloud of hot justice. Unfortunately, not everyone saw it that way. Two women, one of whom got pepper spray in the eye, attacked him and drove him off. One woman in the group said, "A little argument broke out between our group and the other group, and all of a sudden we were attacked. I turn around and we're being attacked by these guys wearing Halloween costumes." The mixed martial artist, known as "Fear the Flattop", was later arrested and put in jail. In fact, he had just sprayed a group earlier that night. "You can't go around pepper spraying people because you think they are fighting," said Seattle police spokesman Det. Mark Jamieson. Police added, "If you see something that warrants calling 911, call 911. You don't need to dress up in a costume to do that." The next guy's had a great costume...or did they? In two separate incidents, a man dressed as Darth Vader robbed a bank. 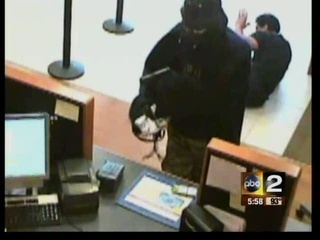 First, in Long Island, a guy goes in bank wearing Vader's helmet, a black shirt and a long cloak. One guy starts joking with the him. It turns out this cosplayer had gone to the Dark Side. "The customer thought it might have been a joke, and not a serious attempt at a robbery," said police. Vader didn't force choke the guy, but he did get into a "shoving match" with the customer. He screamed "This is not a joke!" and pulled out a gun. The tellers filled up a New York Yankees bag with cash. I always knew the Yankees were the path to the Dark Side. In the second story, a guy goes into a Toledo bank with a Darth Vader mask and a handgun. He robs the bank and escapes on a BMX bike. Neither man was caught, proving that the Dark Side is a powerful ally. One muppet went to the Dark Side in our next story. 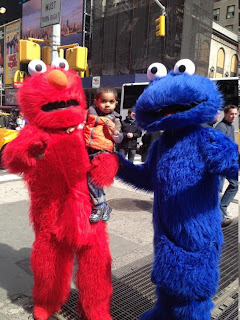 Two-year-old Samay Katkar and his mother Parmita Kurada go to Times Square and see a guy dressed as Cookie Monster from Sesame Street. Without the parent's permission, he picks up little Samay to pose for a picture. A little boy posing with everyone's favorite blue, cookie-munching puppet. Great fun right? It turns out Osvaldo Quiroz-Lopez, 33, was expecting a tip. The mom didn't have any cash, so her husband went to get some. But Osvaldo wasn't getting his two dollars fast enough, so he starts cursing her out. Cookie Monster shoves the little boy and almost knocks him to the ground.The jerk was arrested and charged with assault and endangering the welfare of a child. Now, the boy hates Cookie Monster. You'll hate lightsabers after our next guy. 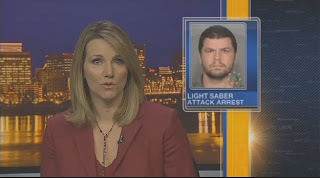 In another Star Wars related story, a guy walks into a Toy 'R' Us in Oregon and picks up a lightsaber. Haven't we all? 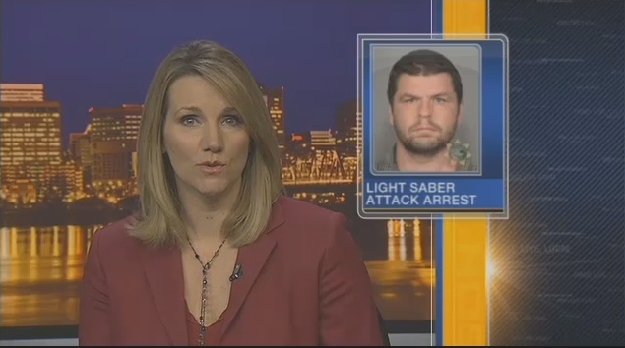 David Allen Canterbury, 33-years-old, starts swinging the lightsaber at people. He hits three people and somebody calls the cops. Canterbury goes to the parking lot and the police say he's yelling incoherent statements, presumably about Padme. That's when the police decided to use their Tasers on him. Canterbury just knocks the wires away. Before he can "force-jump" the police tackle him and take him down. Yes, the police won the standoff against a single guy with a plastic toy weapon. 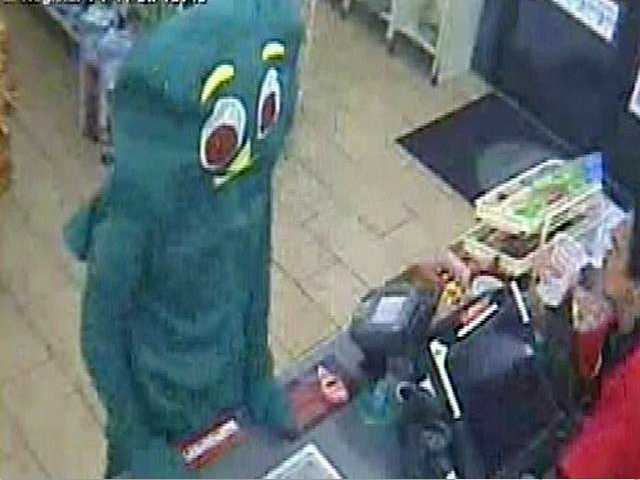 In L.A., a guy walks into a 7-Eleven wearing a gigantic Gumby costume. He's there with another guy who, apparently, refused to dress like Gumby's horse pal Pokey. Gumby's there for a pack of cigarettes and to rob the store. 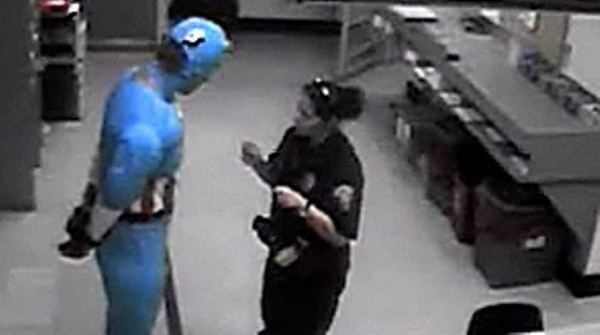 The clerk, thinks its a joke, but the green clay man says, 'You don't think it's a robbery? Let me show you my gun." He fumbles around, but his hands are took big for his pockets and he drops 27 cents on the ground. The guy's friend gets bored, goes back to the minivan and starts honking his horn. The robber's costume starts falling off and he leaves. He's the first robber in history to leave with less money than when he came in. The next bank robber got caught for all the wrong reasons. In Hamburg, New York a dude walked into the Northwest Savings Bank bank wearing an Incredible Hulk ski mask. Nothing wrong with that. 28-year-old Jacob Lester of Angola ordered the teller to put cash into a bag and ran off. Lester would have gotten away with it except someone recognized him. He'd been arrested a few days before at the McKinley Mall for shoplifting. 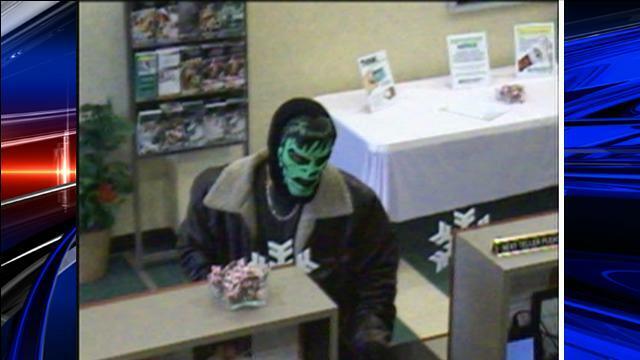 Someone gave a description of Lester before he'd put his mask on outside the bank and the arresting officer at the Mall realized they were the same guy. He also recognized the necklace Lester was wearing. Hulk like jewelry too much. Are these the worst cosplay crimes you've heard of? have you heard of a robbery or crime with a goofy costume? Safe to say none of those people were the sharpest knives in the drawer. 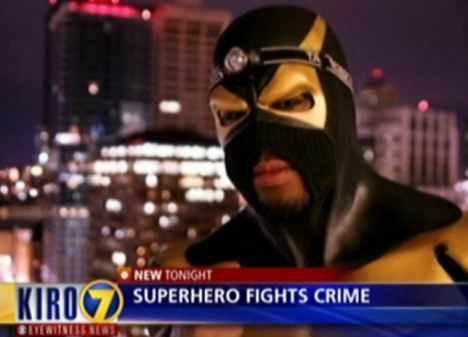 Phoenix Jones was by far my favorite. Great post. A Darth Vader mask is a lot cooler for robbing a bank than a Richard Nixon mask. I think if I were still doing the "Practical Superheroism" segment I would put a note in there not to run around randomly pepper-spraying people. Wow! You know one day a group is going to get together and try to pull off an Avengers or Justice League armed robbery crew. Clearly no one is driving these buses. This would be funny if more of them were dressed as villains. This was great! My favorite was the Gumby one. "The guy's friend gets bored and goes back to the minivan outside and honks his horn." I think he had smoked something other than cigarettes earlier. gumby is guilty... send him to the pokey. Not Gumby! He's just a little green slab of clay. That is a great idea! I might do it just for the photo op. Yet another great tip Pat! If Phoenix Jones is considered a criminal, then J Jonah Jameson has been right about Spider-Man all these years too!